The health of both rural and urban communities depends on sustainable farmers. The average age of a US farmer is 58 and climbing, and we need new farmers now more than ever. CUESA’s farmers markets create a vital opportunity for family farms to not only survive, but thrive for generations to come. As 2016 comes to a close, we’re featuring members of our community who embody the healthy world we all want to see. This week, we want you to meet fifth-generation farmer Mollie Sitkin of Old Dog Ranch in Linden, California, just outside of Stockton. Mollie joined CUESA’s Ferry Plaza Farmers Market last year, selling her new line of candied and savory nuts made from the walnuts on her father’s farm. 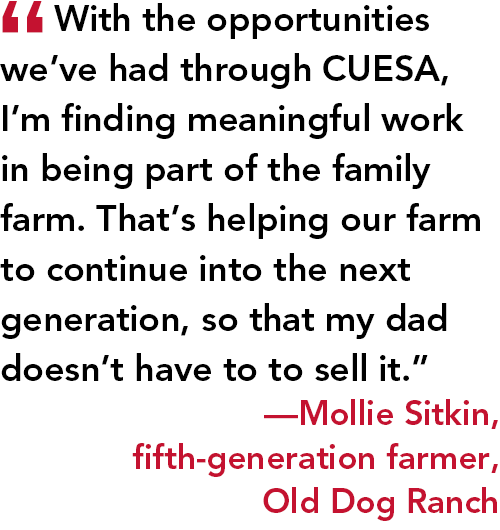 Being part of the CUESA community has helped Mollie launch her business successfully, so that Old Dog Ranch can remain a viable farm and stay in the Sitkin family. I grew up on our family farm, and my dad farmed apples and walnuts. I loved helping around the ranch. I always loved food, and we did a lot of cooking. My mom taught me how to make blackberry ice cream with wild blackberries from the ranch. This was an early introduction to how delicious things could be made with homegrown ingredients, which has shaped my path as a farmer and food maker. It’s challenging to have a family farm and expect that each generation is going to do the exact same thing. I felt very drawn to being a farmer, but to make a living I needed to have a unique offering. In 2014, after some time away, I came back to the farm and started a new line of seasoned walnuts and walnut butters, using walnuts exclusively from my father’s farm. I also grew peppers to spice our walnuts, and raised bees for honey to add to the walnut butter. We started selling our walnuts and value-added products directly to shoppers at CUESA’s Ferry Plaza Famers Market. With the opportunities we’ve had through CUESA, I’m finding meaningful work in being part of the family farm. That’s helping our farm to continue into the next generation, so that my dad doesn’t have to to sell it. My dad always wholesaled everything to big buyers, so he never got much reward for the high quality of his product. Because we now sell at the farmers market, his walnuts don’t have to go into a distributor’s bulk supply. My dad is now recognized for his single-orchard, super high-quality product. There’s no other organization that supports us the way CUESA does. A lot of new businesses aren’t necessarily successful in the beginning. Being included in the best farmers market in the region has helped build our credibility. We’re able to test new products and get exposure to new buyers and wholesalers. It has also provided stability and helped us grow, so that we’re able to reinvest our profits in the farm. We’ve been able to confidently transition a young orchard to organic, knowing we have a sales outlet that appreciates quality and sustainability. We’ve been able to provide raises for our employees and try growing new things, like a two-acre plot of hazelnuts. It has also allowed us keep the wildlife refuge that we have on our land, instead of planting our entire acreage in walnuts and having a contracting company come in and harvest them so that my dad could make a living. That’s been cool for my father and grandma to see. I remember coming back to the Ferry Plaza Farmers Market a few weekends ago after a seasonal break. It was super stormy, one of the rainiest days I’ve ever done a market, but it was worth it to be welcomed back by all the people that were so happy to see me. To have customers who are willing to do their grocery shopping in the pouring rain and wind, and then thank us for being there—there’s nothing like that. Feeling that appreciated only motivates me to want to do it more! I attribute a lot that to what CUESA does educating our community. CUESA is teaching people and kids about why local food is better on so many levels: it not only tastes better and is better for you, but it’s also better for your community. It is vital to us as farmers to have customers who appreciate what we do. There’s no other organization that supports us that way. A gift to CUESA helps young farmers like Mollie confidently take over the family farm and make their business more sustainable—economically, environmentally, and for eaters like you. Build the foundation for a healthy food future. Make a tax-deductible donation today. Photos by Amanda Lynn Photography and Old Dog Ranch.